The last year was filled with change: new city, friends, lessons, experiences, knowledge, partnerships, collaborations, and challenges. In all the good certainly outweighed the bad. Thank you for visiting in 2011 and all the best in 2012. This entry was posted in Uncategorized on December 31, 2011 by coronino. I’ll be taking the next week or so off enjoying family, friends, dogs, and horses. : ) My best to each of you and your families – Merry Christmas! This entry was posted in Uncategorized on December 20, 2011 by coronino. According to a recent study by Regina Deil-Amen at the Center for the Study of Higher Education, University of Arizona, and Stefanie DeLuca, a sociologist at Hopkins, students graduating from high school are not ready to enter college and/or the workforce. The authors argue that many high school students are graduating from high school lacking a genuine career direction with few options to either continue their education or enter a viable career. One possible solution, stated by the authors, would be to incorporate an academic and vocational track into high school curriculums. This would allow high school students to choose either track or potentially a combination of both. A key point made in the study was a greater need for high school counselors to be trained in academic AND career track guidance. This is particularly true for Latinos that often don’t see their career goals directed toward good career choices. These “barriers” are often a result of environmental factors which are not considered during the advising process. A lot of good information in this one – worth a read. This entry was posted in Uncategorized on December 15, 2011 by coronino. The blogosphere and social media have been abuzz the last couple days regarding Lowe’s decision to pull ads as part of the “All American Muslim” TV show on TLC. Supporters on each side of the issue have been making their cases – both supporting and trashing the organization. The story is a fascinating case study – happening in real time. Ironically, today I had the opportunity to be part of a diversity panel discussion via Diversity Best Practices on the role of social media within the diversity and inclusion space. Obviously, the Lowe’s issue was a topic of discussion in regards to the long-term consequences of their actions. Lowe’s positions itself as an organization committed to diversity, yet its actions have left some questioning its commitment to people of color and diversity in general. Only time will tell how this situation will impact their ability to recruit people of color. What I find puzzling, from a social media context, is why Lowe’s hasn’t managed their Facebook page comments proactively. A quick browse of the 2000+ comments earlier today showed some horrible and despicable comments, mostly directed at Muslims. Secondly, I think there’s an opportunity here for Lowe’s to turn this unfortunate situation into something positive by channeling the energy of the debate into a constructive dialogue. Frankly, it’s long overdue. Lowe’s has a great opportunity to at least continue the debate in a civil and logical manner – if possible. I’m certainly not a crisis management or PR person, but it seems there are some opportunities for the organization to create a positive outcome from a negative situation. And they can do it in real time. This entry was posted in Uncategorized on December 13, 2011 by coronino. How is the economic environment impacting college recruiting? 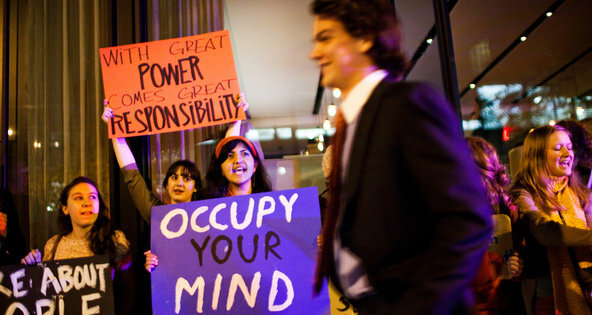 Interesting article via DealBook about Occupy Wall Street protestors demonstrating against banks coming to recruit on-campus. When I recruited “tier one” MBAs years ago, our biggest competitors for top graduates were the banking and consulting industries. No doubt the last decade has taken some of the luster off that career path. This entry was posted in Uncategorized on December 11, 2011 by coronino. The opportunity to walk across the graduation stage in front of family and friends is something a graduate never forgets. Participating in two UTEP graduations as a student, and many others as a staff member, was inspiring. Yesterday, UTEP graduated another 2,000 students, the vast majority Latinos with many the first in their families to graduate from college. Congratulations to my alma maters’ graduates! Just released results from a survey commissioned by the Accrediting Council for Independent Colleges and Schools (ACICS) shows the on-going, and perhaps growing, expectation gap between businesses and colleges. According to the survey, employers think colleges and universities can do a better job preparing students for the workplace. Based on the survey, only 7% of businesses think colleges are doing an “Excellent” job of graduating students who are prepared for the workforce. Ouch! I’ve addressed this issue on other occasions here and here. The alignment of institutional purpose with workforce knowledge and skill acquisition is not foreign to many colleges and schools that have operated successful educational and training programs for decades in the U.S. How quickly or profoundly the alignment and expectation will be applied ubiquitously to higher education remains to be settled. This entry was posted in Uncategorized on December 7, 2011 by coronino. Immigration expert and good friend Leslie Berestein Rojas from the Multi-American Blog (via KPCC) moderated an interesting discussion last night with representatives from Portos Bakery & Cafe, Gaviña Gourmet Coffee, Guelaguetza Restaurante and Tapatio Hot Sauce – all of these businesses began, and in some instances, remain Latino family-owned businesses. Great insights about Latino immigrants, small business, generational differences, and mentoring. Inspiring and emotional stories. Since we moved to Madison earlier in the year, we’ve been renting a nice townhome about 15 minutes outside of the Capitol. While the units are well kept, our kitchen wood floor needed work so I called the complex’s maintenance department to repair it. Marius knocked on my door this morning ready to repair the floor. In a disciplined but courteous manner, Marius went right to work. While focused on my computer screen, I sensed Marius to be a purposeful worker. Every tool was cleaned before being returned to the toolbox. The workspace was free of clutter and debris. While repair of the floor was not problematic, Marius inspected every detail of his labor – repeatedly. When Marius began to collect his tools, we struck up a conversation. It was then that I saw him much differently. Marius is originally from Romania. Twelve years ago he left his country because communism wouldn’t allow him to practice his life’s passion in freedom. Marius wasn’t a carpenter, an electrician or handyman. Marius is an operatic performer. A serious artist. Marius was educated in some of Romania’s best opera schools by some of the world’s best music teachers. When he left Romania, Marius was just shy of earning his PhD in Music. I was fascinated by Marius’ stories. He recounted his travels and performances throughout Romania. Marius’ eyes were aglow as he spoke about opera and his success. Opera is his life. And yet, here he was in my kitchen – fixing my floor. Marius is not bitter. He holds no regrets. He’s a student of his craft – whether it’s carpentry or singing. He still performs. Occasionally, he sings outside his apartment building to the delight of his neighbors who, according to Marius, can hear his commanding voice from blocks away. I hope to – one day. This entry was posted in Uncategorized on December 6, 2011 by coronino. So we turned to local Hispanic leaders Alfonso Cornejo, who is President of the Cincinnati Hispanic Chamber of Commerce, and Jason Riveiro, who sits on the city’s Human Relations Commission and has served as Ohio state Director of LULAC (League of United Latin American Citizens). Both men say they believe the city of Cincinnati has much to offer immigrants and companies that operate on a global level. But, they also agree that other cities and other regions of the country are doing a better job of rolling out the welcome mat, and encouraging diversity in their communities. So does diversity impact business? Just ask Charlotte, North Carolina. This entry was posted in Uncategorized on December 1, 2011 by coronino.